Our Rock Water Fountains are perfect for adding water play to your natural playscape. 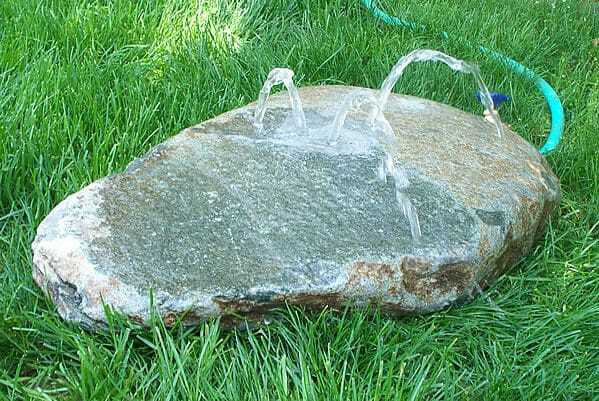 Simply connect a garden hose to the fountain and watch as the water bubbles out of the rock. Children can press their hands against one hole and watch as water shoots higher out of the uncovered holes, then place their hands over two holes and watch the water shoot higher yet. 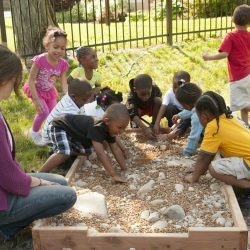 Add the Rock Water Fountain to the center of your sandbox or gravel area to combine sand and water play. Or, place the Rock Water Fountain at the beginning or center of our Build-A-Creek to act as the creek’s water source. The trickle of water from the fountain is perfect for maintaining a gentle flow of water through your natural playground creek. We offer two different styles of Rock Water Fountains for your preschool’s outdoor playground, a Small Rock Water Fountain and a Large Rock Water Fountain. The Small Rock Water Fountain has 3 holes for the water streams to shoot out. Each flow of water will go in a different direction, making all sides of the rock wet at one time and allowing three different children to explore with their own streams of water at the same time. 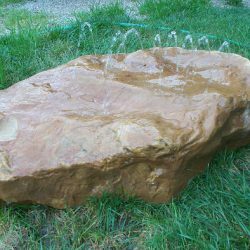 This Small Rock Water Fountain is perfect for placing in a smaller sandbox or our Build-A- Creek. Part of the charm and beauty of nature is in its diversity and uniqueness. Mother Nature custom designs each rock, therefore we are unable to guarantee the exact size, weight, color, or shape. All Rock Water Fountains will not look exactly like the one in the picture. Please ask us about our current supply of rocks. • Before the temperature drops to freezing, drain all excess water out of your Rock Water Fountain and cover the holes so water and snow cannot collect in the holes.